The windows around your property are often overlooked during regular cleaning but dirty windows should not be ignored! When dust starts to collect around your tables, it is easily noticed and cleaned away quickly – but what about windows? Windows might be designed to keep dirt on the outside, but it does not stop it from piling up against surfaces. You might not notice little by little but this camouflaged material can lead to big problems down the line. Instead of waiting for an issue, call Gorilla Property Services for a regular maintenance routine. Our Regina window cleaning can give your space a new shine and, peace of mind. Department stores all over Canada sell basic glass and window cleaners at a reasonable price. The most common method for window washing is to take one of these chemicals and some paper towel and scrub glass clean. This might seem like a good idea at the time, but tools can make all the difference between the right and wrong results. Over the counter cleaners and rags might remove the appearance of spots but they do not do much for long-term results. Our Gorillas do not only focus on the “now” but on the future of your space and the lifespan of your glass, frames and sills. Combining over the counter cleaners with paper towels, creates a static charge against the surface of windows. You might get rid of spots and streaks but this charge attracts any dirt or dust that is in the air. Before you know it, your freshly “cleaned” windows, look dirty again. Instead of being focused solely on looks, a professional window cleaning service extends the life of every aspect of your windows, from top to bottom. Glass is a porous surface, so sitting dirt and debris can soak down into materials, degrading them from the inside and out. Weakened glass is prone to breakage, which leads to unnecessary costs of repairs and replacements. 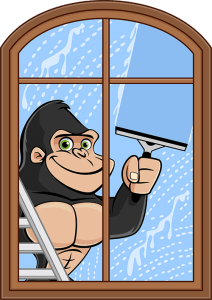 Don’t bother dealing with damage when you can call a Gorilla for your residential commercial or strata window washing. Instead of creating friction through unnecessary wiping, our Gorilla technicians are equipped with eco-friendly cleaning solutions and rubber squeegees. These tools neutralize static charge as well as reach every inch and corner of panes. Our services, whether residential, commercial or strata are not limited to ground-floor establishments. For every window that is out of reach, our Gorillas have a solution. Our technicians don’t need to be giants to reach your higher windows. By using top of the line tools, no window is out of reach (as long as they are four storeys or under). By using water-fed poles and a mobile water source, there are no limitations to a streak free shine. If you are in need of some added shine, our Gorillas can get your space back to its former glory. Exterior window specialists thrive on our results but customer service will always be a top priority. Each and every Gorilla is fully insured when they set foot on your property, so just sit back and enjoy a sparkling view!